The graduating class is made up of 20 LTSS team members who were given the opportunity during the event to express how they have grown and what they learned through the Leadership Academy. The program began as a more in-depth and personal way to learn about services and departments, as well as to foster a network of professional support for the attendees. During the past seven months, the 2018 Leadership Academy class heard from executive leadership, management and families of people we support to further illustrate our mission and to be able to bring the information back to their teams. Executive Vice President and Chief Operating Officer for Long-Term Services and Supports Jim Kelley explained that this is the seventh class to complete Leadership Academy where the primary focus is to prepare staff for managerial roles. “I am incredibly happy for you and proud of you. We want you to return to your roles and share the knowledge about Monarch that you gained. Spread the word to the 1,800 employees that we care about you and most importantly, about the people we support,” Kelley said, noting that within the first six months following participation in the 2018 Leadership Academy, 30 percent of the attendees have been promoted. Jones County Group Home Residential Manager Scott Nunn expressed his appreciation for the opportunity after moving to North Carolina from Vermont. In his closing comments, he likened attending the Leadership Academy to a monarch butterfly’s stages of life. Tenika Baily, developmental specialist at Stanly Industrial Services, told attendees that the course opened her eyes to the many advantages and positives that working with the people we support offers. Diane McAllister, vocational developmental specialist at Monarch Creative Arts and Community Center, explained how she was nearing retirement but knew that her work with the people we support was important enough for her to continue her profession. She shared an acronym with attendees of what Leadership Academy meant to her. Director of Organizational Development Kara Froberg, who coordinated the event, explained that each attendee applied to be part of the Leadership Academy class which met two times a month at different Monarch sites across the state. Executive Assistants Lisa Lisk and Joanna Wallace were also instrumental in coordinating the classes and events. The Leadership Academy students each received a plaque commemorating their achievement. Members of the 2018 LTSS Leadership Academy are: Tenika Bailey, Patricia Blocker, Meredith Burris, Deon Chapman, Jasmine Hailey, Shonda Huggins, Regina Love, Joseph Marinello, Presha Marsh, Diane McAllister, Tamara Moore, Scott Nunn, Vertina Pankey, Althia Pratt, Lateeah Reed, Jolene Stone, Edward Trice, Chelsea Tyson, Siearra Tyson, Gwen Womack. 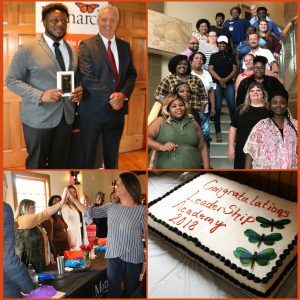 Photo collage: top left, Deon Chapman receives his Leadership Academy plaque from Jim Kelley; top right, the 2018 Leadership Academy class; bottom left, Vice President of Operations, LTSS, Christy Shaver high fives members of the class; bottom right, the lunch included a celebratory cake.